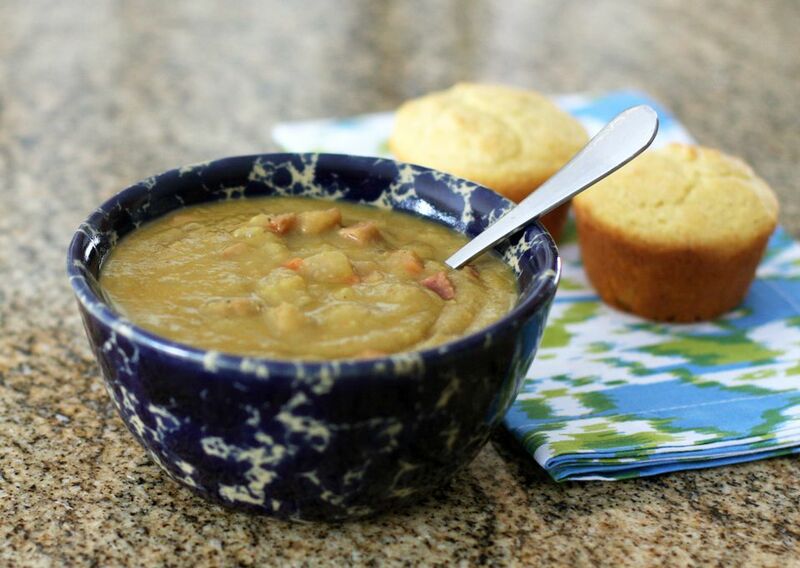 Diced andouille sausage adds heat and flavor to this otherwise traditional split pea soup. Use yellow split peas, green, or a combination of both. We used part vegetable broth because we like the extra flavor it gives the soup. You might want to use your own favorite smoked sausage in the soup. A chicken or turkey sausage or chorizo would be delicious as well. Brown the diced andouille sausage in a skillet over medium-high heat, stirring constantly. Put in the slow cooker with the peas, onion, celery, carrot, water (I use about 4 cups of vegetable broth with 2 cups of water), thyme, and pepper. Cover and cook on HIGH for 4 to 5 hours, or on LOW for about 7 to 9 hours, until the peas are tender and mash easily. Mash some of the peas to thicken the soup. Add salt, to taste. Garnish with chopped parsley and/or seasoned croutons, if desired. Serve with freshly baked cornbread, hot buttered biscuits, or crusty rolls. Combine the browned sausage, onion, celery, carrot, and liquids in a large stockpot or Dutch oven. Bring to a simmer. Reduce heat, cover, and simmer for about 1 1/2 hours, or until the peas are very tender. Stir frequently and add more broth or water if needed.